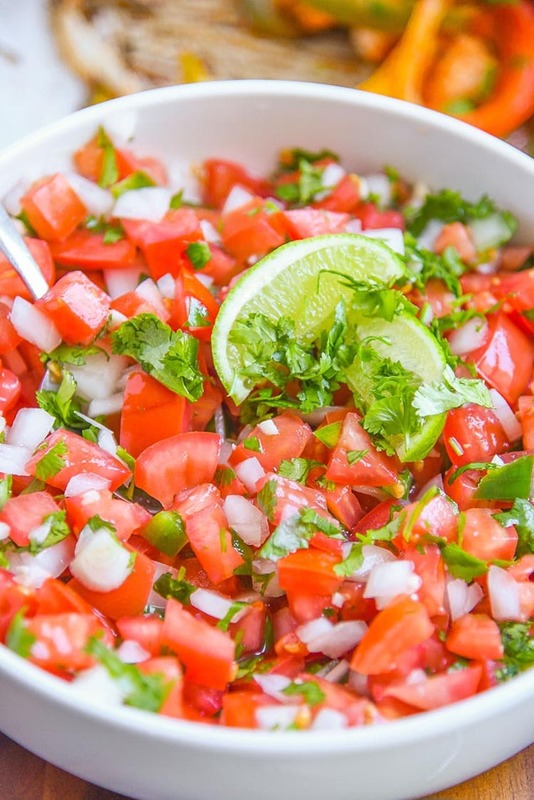 Pico de Gallo is a delicious fresh salsa recipe. Learn how to make this Authentic Pico de Gallo Recipe at home. This is by far the best pico de gallo recipe we’ve made. Learn how to make pico de gallo for tacos, chicken and steak fajitas, or just to enjoy with fresh corn tortilla chips. There’s no reason to buy store bought when you can make homemade salsa at home! Pico de Gallo translation, Pico de Gallo means — It’s a staple in Mexican Cuisine. 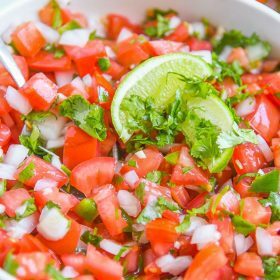 Pico de Gallo is the same as a Salsa Fresca Recipe. Pico means Beak and Gallo means Rooster, so if you put Pico de Gallo translation to English it will give those results, Beak of the Rooster. Not exactly what you think of eating a spoonful of pico, or is it beak! 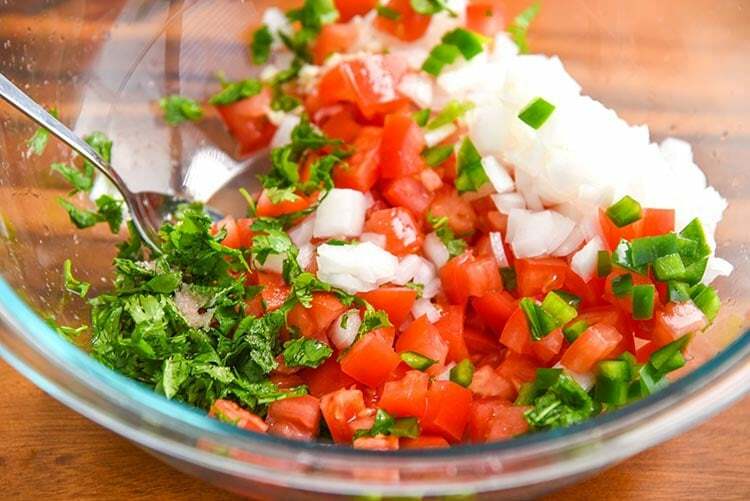 These are the ingredients you need to make our Pico de Gallo Recipe. You can use a blender, but I prefer roughly chopping the herbs and then dicing the veggies by hand. Pico (also called salsa fresco) is actually a type of salsa, but it’s fresh and never cooked. Salsa is usually small bits of vegetables and more pureed, where pico is always chunky and fresh. The most important in making this or any pico de gallo recipes is using all fresh ingredients. 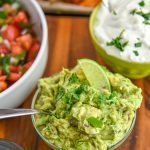 You do not want to use canned tomatoes to make a homemade pico de gallo, but you can use canned tomatoes in a salsa recipe. If you have 10 minutes you can make an easy pico de gallo recipe fresh at home. We always have a batch in the fridge! Kitchen Gizmo 2 Sided TPU Anti-Bacterial Cutting Board, Thick Yet Flexible, Knife Friendly, Scratch Resistant, Juice Groove, Dishwasher Safe, Antimicrobial, and FDA Approved (Green/Brown) When making a fresh pico de gallo recipe we prefer not to use a blender or food processor. It’s best to chop the ingredients by hand or use a vegetable dicer. Invest in a good sturdy cutting board. 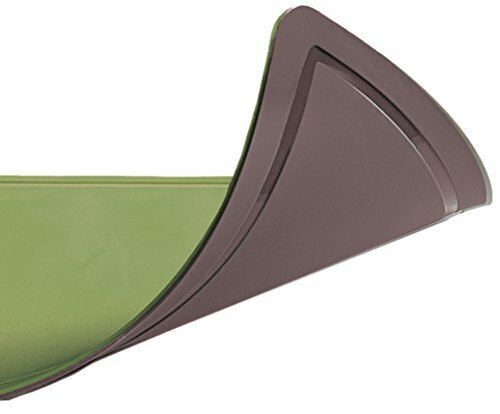 I use one that is flexible and easy to clean. My husband is famous for shredding up my cutting boards and marking them up since we have really sharp knives. I have invested in this affordable cutting board and so far so good! It’s even big enough for when he’s chopping watermelon. So back to cutting by hand. By cutting the ingredients with a knife you can control the chop. I prefer a chunky salsa and chop both the tomatoes and onions chunky, but you can chop as small or as large as you like. The main thing is to ensure you’re using fresh ingredients. This is really where freshness matters, especially with the tomatoes, onions, and cilantro. 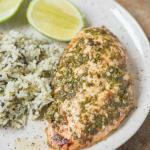 When making this we also suggest using a lime instead of lime juice concentrates. You can really tell the difference in flavor. If you’re going to serve your Pico de Gallo recipe at dinner you should make it a least 3-4 hours before in a large mixing bowl. We actually like to make it the night before if possible. 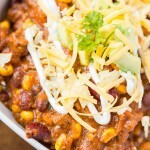 By making it earlier you ensure that the flavors will really meld together. You want each bite of your pico to taste like each flavor. We love Mexican food and the flavor really develops after sitting a little. Pico is a great topping for many dishes, here are a few suggestions! We usually make a large batch and use within 5 days. 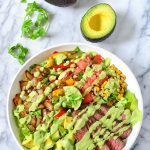 You’ll find that the tomatoes really get broken down from the citrus, so you’ll want to enjoy this recipe for Pico de Gallo before it breaks down too much. It’s the best pico de gallo recipe when you use up before the 5 days. It’s perfect for Cinco De Mayo! I just went to my in-law’s house and made homemade tacos along with a huge batch of pico. I know they love pico so I always make a large batch so they’ll have it for a few days. 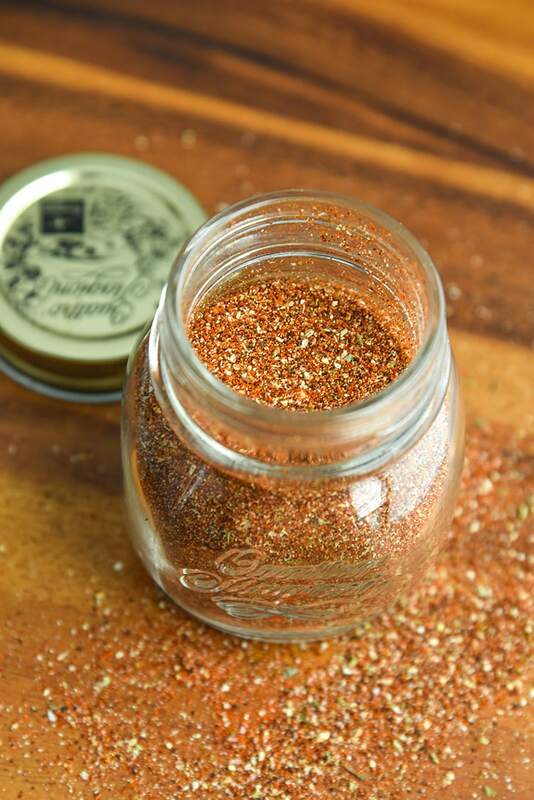 I also made my homemade taco seasoning so they wouldn’t need to buy the taco seasoning packets. She made taco chicken breasts and white rice and poured the pico overtop, it looked so good! Chop up the Roma tomatoes and add in the remaining ingredients. Mix all of the ingredients together until combined. 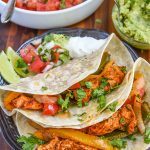 Craving more Mexican Recipes? We have you covered! 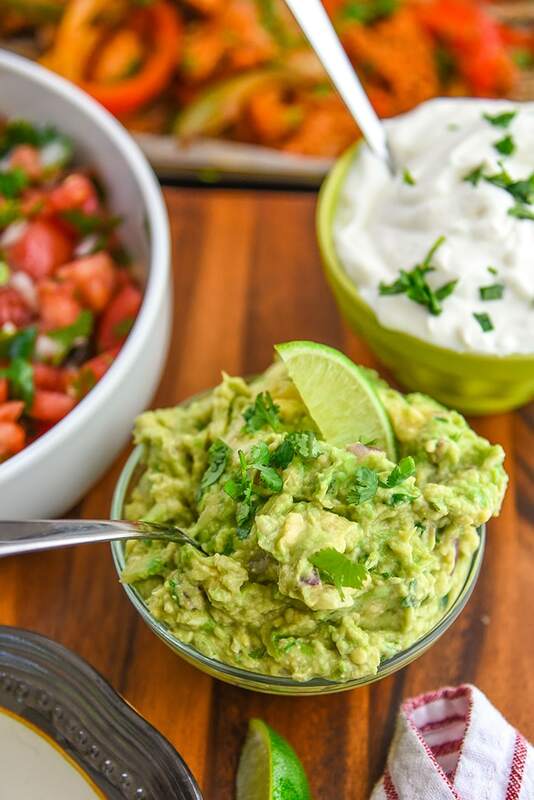 Learn how to make how to make guacamole. 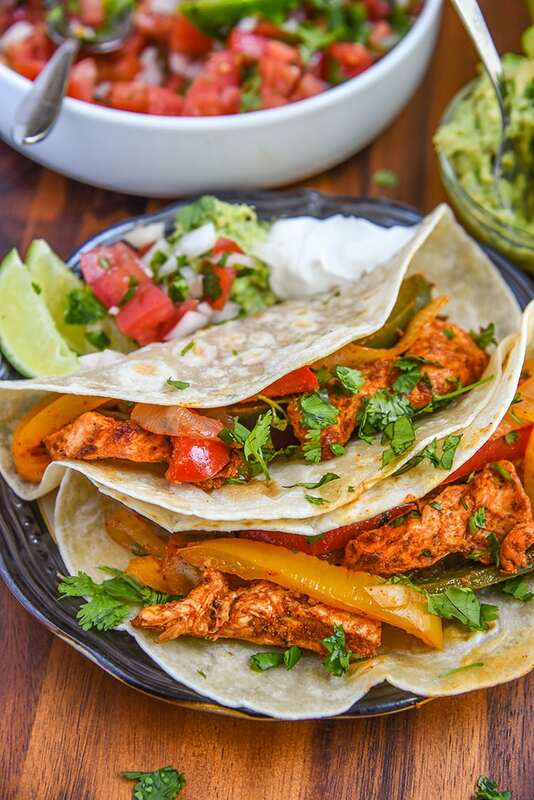 and our Fajita Seasoning Mix – no need for fajita seasoning packets! I love your recipes! Especially the Pico! I have tried several but this one is great! Thanks for sharing! Wow, thank you so much for the sweet comment, Kay! 🙂 So glad you like my recipes!! 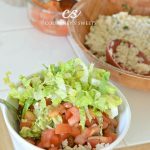 I love pico de gallo, I can’t resist the fresh ingredients and robust flavor! I love the look f that vegetable dicer. It mst make short work of the chopping. Your Pico de Gallo looks so fresh & vibrant. I can’t wait to give it a go. Pico de gallo is great on any type of tacos, not just shrimp tacos. We use it on breakfast tacos, barbacoa, carnitas, and so on. Also great on nachos. And no need to just save it for Mexican/Tex Mex. We use it on hamburgers, too.